2009-01-17. New. Ships with Tracking Number! INTERNATIONAL WORLDWIDE Shipping available. Buy with confidence, excellent customer service! Transaction Publishers. PAPERBACK. 020236285X Special order direct from the distributor . New. Transaction Publishers, 2008-12-31. Paperback. Used:Good. 2009-01-17. Good. Ships with Tracking Number! INTERNATIONAL WORLDWIDE Shipping available. May not contain Access Codes or Supplements. May be ex-library. Shipping & Handling by region. Buy with confidence, excellent customer service! Transaction Publishers. PAPERBACK. 020236285X Brand New, printed in english , Ready to ship, fast delivery (6-8 busienss days ) worldwide . New. Longmans, 1967. This is an ex-library book and may have the usual library/used-book markings inside.This book has hardback covers. With usual stamps and markings, In fair condition, suitable as a study copy. No dust jacket. Longmans. Used - Good. Shows some signs of wear, and may have some markings on the inside. Longmans, 1966. This is an ex-library book and may have the usual library/used-book markings inside.This book has hardback covers. In poor condition, suitable as a reading copy. A Guide to English Literature. Chicago. : Aldine Publishing Co., 1966.. Cloth.. 2nd printing. Good. Longmans, 1966. This is an ex-library book and may have the usual library/used-book markings inside.This book has hardback covers. In fair condition, suitable as a study copy. No dust jacket. Library sticker on front cover. Transaction Publishers, 2011-07-27. Paperback. Good. Chicago:: Aldine. VG, clean HB; DJ-VG.. 1966. ISBN: [Includes extensive Reading Lists] xl + 248 pp.. Catalogs: LITERATURE. Keywords: Literary criticism, BIBLIOGRAPHY. Transaction Publishers. Used - Good. Shows some signs of wear, and may have some markings on the inside. UK: Longmans Green, 1965. Clean green covers, foxing to edges, owner bookplate to front pastedown, vertical brown strip to front free endpaper, internally very good; dust-wrapper is good with some rubbing, browning to spine.. First Edition. Hardcover. Good/Good. Anchor Books,, B00K3B9W00.. Paperback. Used, good. Original 1965 edition, 1966 (2nd) printing. Rated only "good" due to rather heavy underlining in first 57 pages. Slight wear, cover lightly soiled, two pale red marker stripes across lower page edges. **We provide professional service and individual attention to your order, daily shipments, and sturdy packaging. FREE TRACKING ON ALL SHIPMENTS WITHIN USA. Aldine Pub. Co., Chicago. "Second printing, 1966". Hard Cover. "...primarily a bibliographical labor-saving device... to explore at all seriously any of the classics or classical areas of English literature down to the present day." Contents include General Works on English Literature; The Approach to Medieval Literature; A Middle English Reading List; The Approach to Renaissance Literature; A Renaissance Reading List, 1500-1650; The Approach to Augustan Literature; An Augustan Reading List, 1650-1800; The Approach to Romanticism; A Reading List, 1800-1960; Literary Criticism in English; Literary Scholarship: an Introduction to Research in English Literature; Index. xii, 258 p., 21.5 cm. ; dj has minor wear, spine a bit darkened; VG. 34150. London England: Longman, 1966. Paperback. In addition to the listings this Guide contains long 'inter-chapters' that provide re-interpretations of the principal period of English literature in the light of modern research, as well as two final sections summarizing in unusual detail the literary criticism that exists in English and recent scholarship in the field. 260 pp. (We carry a wide selection of titles in The Arts, Theology, History, Politics, Social and Physical Sciences. academic and scholarly books and Modern First Editions etc.). Second Impession. Soft Cover. Good. 8vo - over 7¾" - 9¾" tall. Paperback. Doubleday Anchor Books: Doubleday Anchor Books. 1965. 2nd ed. softcover. 1125397209 . B020754; 259 pp softcover, very good contents & wraps . Chicago: Aldine Publishing Company. Hardcover. 2nd printing. books carefully packed and shipped promptly . Very Good. 1966. Aldine, 1966, 1966. Hardcover. VERY GOOD. Hardcover/Very good, DJ, 258pp. .
Doubleday & Company (Anchor Books). Used - Good. Former Library book. Shows some signs of wear, and may have some markings on the inside. Anchor Books. Used - Very Good. Very Good condition. Doubleday Anchor, 1968. Used - Good. Good condition. 2nd Revised edition. Highlighting inside. Writing inside. Doubleday & Company (Anchor Books). Used - Good. Good condition. Owner's name Stamped on inside. Chicago, IL: Aldine Press. Very Good in Fair dust jacket. 1965. Second Printing. Hardcover. DJ torn and worn at extremities. Private bookplate on endpaper. .
London:: Longmans & Green,, 1965. First edition. Paperback. Very good+. Previous owners name on ffep. Heavy creasing and scuffing to cover. USA: Anchor Books/Doubleday, 1965. Paperback. Good/No Jacket. Trade Paperback in Good Condition. 259 pages. Slight edge wear; two lines of darker yellow on the yellow cover. Clean and tight book. Previous owner name on first page. 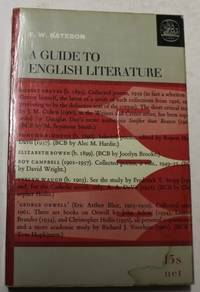 A short bibliography of English Literature, with commentary on the principal editions, commentaries, biographies, and critical works. It also includes an interpretation of the principal periods of English Literature and a detailed summary of the literary criticism that exists pertaining to English Literature. The purpose of the book is to provide the reader with everything needed for a disciplined study of the texts themselves. Chicago: Aldine. Very Good in Very Good dust jacket; Few spots of lightening on . cloth-covered boards. DJ has light wear, price sticker on front. Address . label on front end page.. 1966. Hardcover. 8vo 8" - 9" tall . Condition: Very Good in Very Good dust jacket; Few spots of lightening on cloth-covered boards. DJ has light wear, price sticker on front. Garden City, NY: Doubleday Anchor Books, 1965 1st ed. (Anchor Original). 259pp. paperback: near Fine. A standard work by the English scholar Frederick Wilse Bateson (1901-78). No stated publisher, 1965. 1st Edition. Softcover. Very Good Condition/No Dust Jacket. Book Item Type: Book. Category: Essays & Literary Criticism; Literature & Literary. Please contact H4o Books if you require images or further information. Inventory No: 011758. .
Anchor Books. Used - Good. Ships from the UK. Shows some signs of wear, and may have some markings on the inside. 100% Money Back Guarantee. Your purchase also supports literacy charities. Aldine Publishing Company, 1965. Hardcover. Good/Good. Wear to edges of dust jacket, previous owner's book plate on first inside board. Spotting to top edges of the pages. Prentice Hall Press. Used - Good. Ships from the UK. Former Library book. Shows some signs of wear, and may have some markings on the inside. 100% Money Back Guarantee. Your purchase also supports literacy charities. Longmans, 1968. This is an ex-library book and may have the usual library/used-book markings inside. .This book has soft covers. In fair condition, suitable as a study copy. Doubleday & Company (Anchor Books), December 1964. Mass Market Paperback. Very Good. Very little external wear, text sharp and clean, binding firm. Saw one underlined word in text. Doubleday & Company (Anchor Books), December 1964. Mass Market Paperback. Good. Remainder, stain on back cover, otherwise clean and solid. Garden City NY: Doubleday & Co., Inc., 1965. Wraps have light wear. Pages are clean & text is free from markings. All pages secure in binding.. Soft Cover. Good. 8vo - over 7¾" - 9¾" tall. Ex-School Library. Doubleday & Company, Inc, 1963-01-01. Mass Market Paperback. Good. 1965 Printing. A good copy with a tight and square binding. Text is clean and bright. Previous owner's initials and price are on first front end page. Covers are good but lightly scuffed. Careful packaging and fast shipping. We recommend EXPEDITED MAIL for even faster delivery. Anchor Books, 1965. Prior owner's name. Pages clean, unmarked. Binding firm.. Wraps (Paperback). Moderate edge & Shelfwear. Doubleday Anchor, 1968. Second Edition Revised . Fine and bright stiff wraps with strong square spine and crisp bright text throughout.